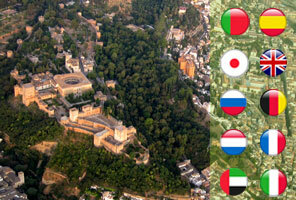 - Get an amazing Alhambra tour exclusively for your group. - Skip the line and enjoy a private guide with Alhambra tickets included. Are you coming to Granada with your group of friends, family, classmates or workmates and you don’t know how to book a tour of this old Moorish fortress? We'll take care of it. No matter how many are in your group, you can see the amazing Nasrid Palace with a private guide for you. You will visit the Nasrid Palaces, consisting of the Mexuar Palace, Palace of Comares and the famous Court of the Lions, the gardens and palace of the Generalife (playground of the kings of Granada), the Partal Palace, the Alcazaba (military area) and the Palace of Charles V.
Also, you won’t have to worry about how to buy Alhambra tickets, and for added convenience we offer a shuttle bus that will pick you up and take you back to your hotel after the excursion, or to another place if you wish. (1) Official private guide for your group, who will answer any questions or doubts that you may have about the monument. (2) The purchase of tickets, which our guide will give you at the time and meeting point indicated before. You won’t have to wait, skip the line! 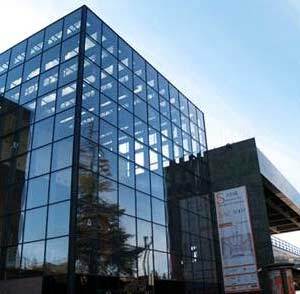 Time and Meeting Point: The meeting point will always be at the Granavision Welcome Visitor Centre, next to the Alhambra (just 100 meters from the Car Park N1, next to Guadalupe Hotel), the TIME OF APPOINTMENT chosen by you (TIME APPOINTMENT). Although the tour will start from 10:00am, our Reception Centre is open from 8:30am, so we recommend you go early in the morning, so you can find out information about tourism offers in the city, enjoy our reading spot and free Wi-Fi area or have breakfast in the cafe while the children have fun in the playground. Our greatest wish is that your day in Granada starts in the best way possible. End of the guided tour: It will finish at the same point of meeting. - If you want a pick-up at your hotel or at any other place, whether in Granada or another city, just request a budget:reservas@granavision.com or (+34) 958 535 872. - We recommend to drink plenty of water, to wear comfortable shoes and to bring sun protection items, because of the length of the walk. - Sometimes the itinerary of the guided tour may be altered, following instructions of the Patronato. - If you want to modify or cancel your booking, please contact us via the customer service form. After you make your booking, you will receive a confirmation of purchase email and the voucher of the tour. This voucher must be printed and showed to our guide at the beginning of the guided tour to receive your tickets to the monument.